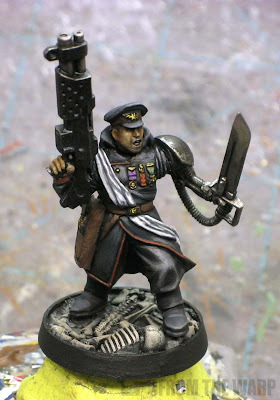 And here we have the painted Iron Hand Straken model I was working on earlier this month. I kept the colors muted overall so that he matches up with my friend's army as best as possible. I did add some spot colors here and there though to liven him up a little bit. One thing I realized I was missing in the middle of painting was his right thumb. 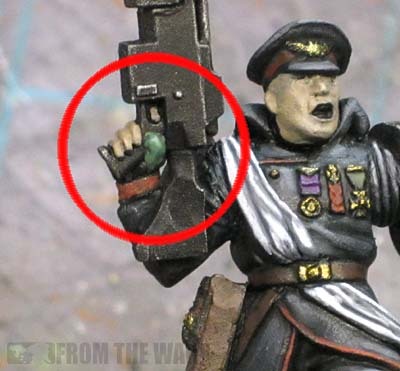 It was never there when I did the conversion and I didn't know it was missing until I went to paint his hand. Easy enough to fix, I just sculpted one in place real quick and kept working. Of course this guy was primed and based with black. I wanted a dark model overall. The trick becomes finding a number of different ways to show black objects. Painting his black gun the same way you paint his black cloak and black pants doesn't get the point across very well in the end. For the cloak, I decided to give it a slightly blue tint and used P3 Coal Black to highlight it. I went over that initial highlight with a Nuln Oil shade and then went over a few key spots with GW Mechanicus Standard Grey to draw out some detail. For the pants, I started with the Mechanicus Grey, washed that with Nuln Oil and then added a slightly lighter grey highlight on top of that. This helped separate my pants from my coat in terms of the material they were made of. The gun was the biggest challenge of all. I wanted it black and very militaristic looking. I didn't want to highlight it using either of the methods I already used on his clothing. I ended up applying a very light drybrush of GW Leadbelcher to the edges. This was a super light drybrush along the prominent edges only. Then the gun was given a wash of Nuln Oil to tone the flat areas and make the edges pop even more. This makes it look metallic and made of something completely different than the "black" things on other parts of the model. The base is a skull themed base from Secret Weapon minis. Instead of pulling the original base apart, I tried to stay with the theme my friend already had in place and this base worked perfectly. It was primed black and I used a series of heavy drybrushing to pull out the detail of the skulls and bones. I just added a little lighter color each with each pass and added that to the higher, more pronounced bones for effect. All in all, I think he came out fairly well for being done in all "black." That was the biggest challenge with this model. Trying to find a few distinct ways to show black without repeating the technique was a little tougher than I realized. I also did not use any powders or other fancy effect on this model. Granted it limited what I could do in terms of effects overall, but I wanted my friend to be able to touch up the model or repaint anything he wanted to if he felt the need. great work! I know it's not really the topic of the article, but the face is remarkable! Piotr: Thanks. I actually went back and added a tiny bit more contrast to it before sending it off. It was a little flat looking overall. Your stuff is always top notch Ron, chalk up another solid model, your black was incredibly well done. 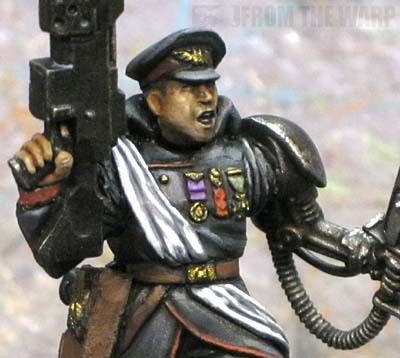 Love your painting style Ron, every since you started those posts on Raven Guard characters back in the day I've been drawn to your style of painting blacks and skin tones. The shotgun looks rather scary as well, Straken would be proud! Love your stuff Ron, of all the blogs I read yours is by far my favorite. I use P3 coal black to highlight all my black just love the look of it. A number of your ideas are working their way into my toolbox of skills, the shotguns are being applied to my Fleshtearer scouts soon. Keep up the good work!!! That really turned out fantastic! Great work as always Ron (as though there was ever any doubt). Love it, I definitely plan on trying a shotgun build as you've done, as I have about thirty zillion flamers left over from years and years of guard armies. Awesome work! The head and the pose is spot on. I like the way the different colors on the medals and ribbons stand out and break up the grey. Hephesto: I've gone through a couple different ways to do black now. Good thing since this model made me use most of them. EllisW: That's how I was when I first saw Coal Black. It just looked like a cool color so I bought it and decided I'd figure out where to use it later on. 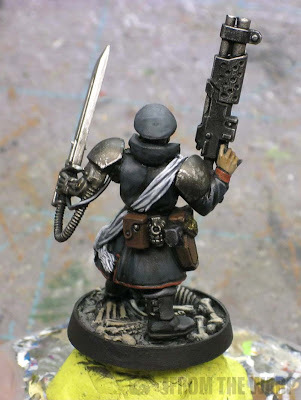 Mordian7th: If I ever do shotgun toting Scouts, I'm using this conversion for sure. Reid: Thanks. It was those and the sash that I used to break up the big areas of black and add a little bit of life to him. had a go at making a blog, any words on what you think or advice for someone who hasn't worked with this before? Chris;: Start small and expand as you learn what you need for your blog. You may not need all the bells and whistles right away. You can learn a lot by watching what others do on their blogs and think about the features you like to use when you visit someplace. The same goes for the features you don't like to use as well. It can be lots of experimenting, but you should always be working towards your goal.